You will be creating an informational report that focuses on an animal's adaptations. The report needs to include the following information. The items in bright green should be your headings. Include the COMMON & SCIENTIFIC NAMES of the animal. You will make a chart about the animal's ADAPTATIONS. 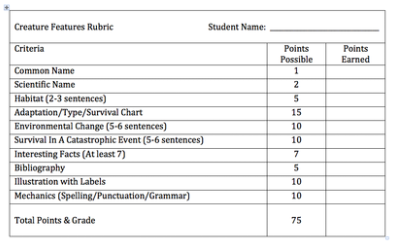 This chart will have three headings: Adaptation, Type, and Survival. You will include 3 adaptations. In the Type part, just state if it is a physical or behavioral adaptation. In the Survival part, you need to thoroughly explain how the adaptation helps the organism survive in its environment. Include your research sources. Entitle this part BIBLIOGRAPHY. It would be best to start a Google Doc with your resources, but your rough draft will be on lined paper. Include an image of your animal from the internet. Proper spelling, grammar, and punctuation is expected. You will type this project in GoogleDocs using the Creature Feature template and submit it to Google Classroom for a grade. This project will be displayed in the hallway. Please put forth your best effort. Before you type, show Mrs. Cole your rough draft.